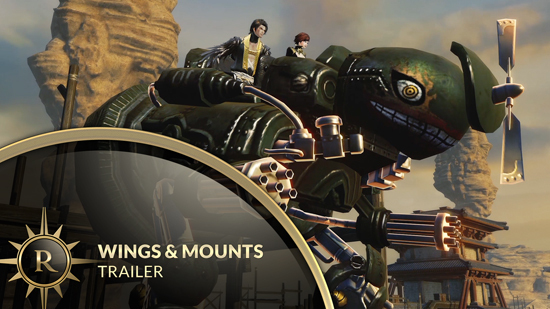 Mounts and Wings in Revelation Online, showing how players can traverse the world of Nuanor. Not too long after players start their adventure, they will gain access to their first mount, where they can choose from one of three different colored horses. At level 29, players will gain access to their first set of wings, allowing them to fly seamlessly throughout the skies in Revelation Online. From there on, the choices expand further and players can acquire a wide variety of ground based and aerial mounts, some of which can transport other players or even a full group of adventurers. As players progress through the game, they can attain class exclusive mounts and even gain access to combat skills, which will allow for aerial battles and also target foes on the ground. Discover the lands of Nuanor with any of the three packs: Explorer Pack, Founder Pack, and Deluxe Pack. Any of the three packs will give players exclusive rewards up to and including: two exclusive costumes and titles, a unique war horse, a set of wings, several months of Premium, and boost packs.